Permanent cold environments account for a large portion of the Earth. These environments are inhabited by various micro-organisms that have often adapted to unique combinations of selection pressures. Therefore, there is considerable interest in understanding survival strategies utilized by extremophiles to exist in such harsh environments. 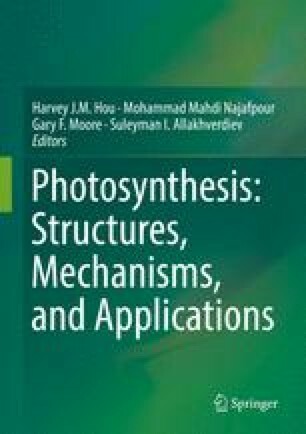 This chapter summarizes common adaptive mechanisms of psychrophilic organisms with focus on the unique photosynthetic characteristics of a unicellular green microalga, Chlamydomonas sp. UWO241. Chlamydomonas sp. UWO 241 was isolated from perennially, ice-covered Lake Bonney, Antarctica where it has adapted to constant low temperatures and high salinity. A unique characteristic of this algal strain is its inability to undergo state transitions combined with its high rates of photosystem I cyclic electron transport. Consequently, in contrast to mesophilic green algal species such as Chlamydomonas reinhardtii which undergo state transitions, Chlamydomonas sp. UWO241 does not phosphorylate LHCII polypeptides. Rather, the Antarctic psychrophile exhibits a unique, light-dependent, thylakoid polypeptide phosphorylation profile associated with a photosystem I supercomplex which also contains the cytochrome b6/f complex. The stability of this photosystem I supercomplex in Chlamydomonas sp. UWO 241 is sensitive to its phosphorylation status as well as high salt concentrations. The role of the photosystem I supercomplex and its phosphorylation status in the regulation of photosystem I cyclic electron transport is discussed. We suggest that Chlamydomonas sp. UWO 241 should be considered a model system to study psychrophily and adaptation to low temperature in eukaryotic photoautrophs. BS is the recipient of an NSERC Postgraduate Fellowship. NPAH gratefully acknowledges the long-term financial support from the NSERC Discovery Grants programme as well as funding from the Canada Foundation for Innovation and the Canada Research Chairs programme. Takahashi H, Clowez S, Wollman FA, Vallon O, Rappaport F. Cyclic electron flow is redox-controlled but independent of state transition. Nature Commun 2013; 4 DOI: 10.1038/ncomms2954.